SUNNYVALE, Calif.--(BUSINESS WIRE)--TrackNet, Inc., a cutting-edge LoRaWAN™ Internet of Things (IoT) solutions provider for consumer and industry, announces the unveiling of Tabs™ at Mobile World Congress (MWC) in Barcelona, Spain, February 27-March 1. Tabs combines a Wi-Fi / LoRa hub with Internet parental control and a broad range of sensor devices using long-range wireless technology with an easy-to-use mobile app to monitor child safety, home security, and home health. The Tabs hub provides Wi-Fi coverage over an entire residence and Tabs sensor coverage over entire neighborhoods with significant benefits not only to consumers but also to operators and service providers deploying Low Power Wide Area Networks (LPWAN). For operators and service providers, the Tabs hub installed within customers’ homes accelerates and scales LPWAN deployments much faster than a solely tower-based approach, easily provides deep indoor coverage and significantly reduces the network deployment capital and operation expense. Each Tabs solution starts with a wireless hub, which provides the Tabs sensor coverage over an entire neighborhood or high-rise development, delivering immediate benefit to the consumer. Each solution further includes a Tabs extender, which is a Tabs sensor hub but not a full Wi-Fi router, to ensure coverage over the locations most frequented by families such as school, day-care, or a friend’s house. As more users install Tabs hubs and extenders, they collaborate to build or improve network coverage over an entire city or region, giving the users additional benefit for locating children, pets, elderly or things. Most cities can already have 100 percent network coverage if just a few citizens utilize the Tabs solution. This LoRaWAN network coverage built from the indoor Tabs hubs also has significant benefit to network operators who have deployed light outdoor network coverage with existing cell tower infrastructure. The hybrid deployment model of numerous in-home and in-building gateways mixed with light tower coverage is quickly being recognized as the optimal deployment model for LPWAN and being adopted by major operators globally. In addition to providing connectivity, the Tabs hub also shields children from inappropriate web content and allows web time limits through the easy-to-configure Wi-Fi parental control feature on the mobile app. For children, the Tabs child wearable sensor gives parents visibility into their children’s location and activities. Parents can set alerts to be notified, for example, when their children enter or leave a location, don’t come home on time, or take longer than usual to get to a friend’s house. Kids can be more independent but are just a button push away from mom and dad using the Tabs messaging feature, which allows children to send quick messages saying, “I’m safe,” or “ready for pickup,” without the cost or concerns of providing them with cell phones. For homes, Tabs offers a suite of devices designed to protect the safety and health of families. Its door, window, motion sensors, configurable push button, and multi-purpose trackers pair with the Tabs mobile app, giving families better visibility into what happens when they’re away or asleep. Tabs further monitors air quality, temperature, and humidity to ensure homes are healthy and comfortable, and alerts users in the event that harmful gases or poor air quality is detected. A push button feature on the multi-purpose tracker and in the form of a dedicated device lets users have one-touch access to frequently used functions. The Tabs solution interfaces with Amazon Alexa and IFTTT-enabled devices so it can be combined or integrated with other home solutions such as Wi-Fi controlled lighting. Tabs further facilitates the next generation of neighborhood watch, allowing users to share alerts with neighbors or friends while away at work or on vacation. Tabs is now in trials with service providers who will bring it to market. To learn more about Tabs or to schedule a meeting at Mobile World Congress for a private demonstration of the Tabs solution, contact sales@tracknet.io. For more about Tabs visit http://tabs.io and for more about TrackNet visit http://www.tracknet.io/. TrackNet provides highly scalable LoRaWAN IoT solutions for consumers and industry, focusing on ease of use and unparalleled scalability to enable a new era of exponentially growing LPWAN deployments for a sustainable world. TrackNet is developing end-to-end solutions including sensors, gateways, and apps with optimized user experience for targeted LPWAN and IoT applications. The company is a contributing member of the LoRa Alliance and the TrackNet team has been instrumental in specifying, building, and establishing LoRaWAN and the LoRa Alliance for more than five years. It has been brought to life by former Semtech and IBM employees with cumulated decades of real-world experience in embedded and RF systems, wireless networks, network management, end-to-end security, and solutions development for the whole spectrum from small-scale private networks to carrier-grade deployments. TrackNet has offices in Switzerland and California, USA, and is looking to build a talented, passionate team to realize IoT and LPWAN applications. More information is at www.tracknet.io. 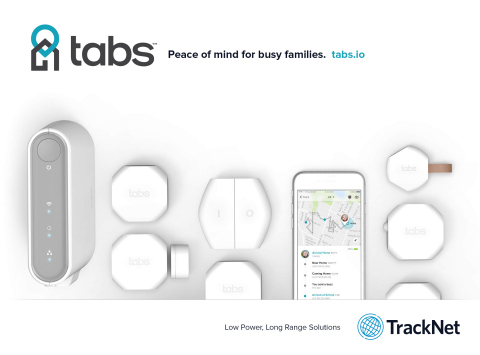 TrackNet has unveiled Tabs™, an IoT-based system including a long-range wireless hub, a range of sensor devices and an easy-to-use mobile app to monitor child safety, home security, and home health.